Marketers have long searched for a way to generate word-of-mouth, WOM, advertising. But it is hard to make your audience think about you; it’s a very Inception-like-mentality. You cannot create an idea and expect someone believe it is their own original idea. So, with sites like Twitter, you can share a question that can steer your audience to your brand and eventually your product. This, my friends, is a way buzz is born. As the old adage goes, a picture is worth a thousand words. Now, you can’t have a thousand words on Twitter due to that pesky 140 character limit, but words are words nonetheless (especially if they are about you!) Images get 20 times more responses than text posts alone. Make sure the image is yours so you do not get yourself into any copyright trouble. If the picture is not yours, attribute it to its photographer or source. Places like Flickr can let you access many photos. Posting pictures on social media sites like Path, Twitter or Facebook will give your brand a face and a personality. Photos are relatable and shareable. 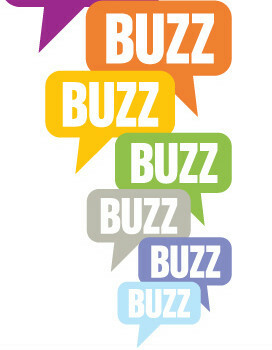 Next time you create a post, consider adding a snapshot for buzz potential. Stop talking about yourself! Seriously. You know that annoyed feeling you get when someone is going on and on about how they love going to the gym and eating healthy? You decide to unfollow them because they are so arrogant. Same thing goes for your brand. The more you talk about how awesome you are, the more people will become sketched out and skeptical about you and the less they will care about what you are saying. Make the conversation about your audience. Talk about your newest client and make a blog post that has them in the spotlight. Have your consumers post pictures and video of themselves using your product. This is popular with apps like Vine and Instagram. Create contests that breed engagement. Want to get to people talking fast? Ask them questions. People love talking about their experiences, whether good or bad. Their friends will see how they feel about a certain product and may act on it. E-WOM, electronic word of mouth, is a techy take on the original method but is even more effective considering people are disseminating their ideas through social media. By asking questions you can include your name in a conversation and find out how people are reacting to your brand. It’s a great way to make improvements on your product, as well. It also allows you to show your expertise. By answering questions others may have, you build your brand’s credibility. I am not telling you show skin on your next tweet; that would be a little excessive. However, talking about topics that push the limits is a great way to get others talking. You want others to realize that you are in the “know” about worldly issues that somewhat pertain to your field. Share news articles and put the name of your source in a “@” handle or hashtag. Also, ascertain with your management that your topics are in line with the values of your companies. You don’t want to lose your job because something was buzz-worthy. While taking my last few advertising classes as a senior, the media management courses took a turn into technology. The term social media was still an enigma to my seasoned professors. They told us that the way to use these tools was up to our generation to decide. We have the power to change the conversation. How Can Small Business Startups Build a Strong Team?